1. I love sitting in the stands near players’ camps, and hearing what they say under their breath, or to the player. 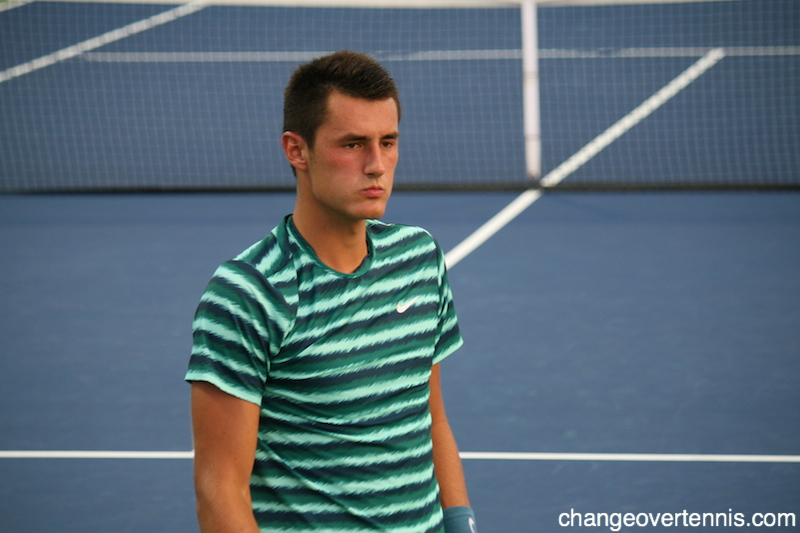 Today, as Bernard Tomic was losing to Gilles Simon, one of the members of his team said to him, “It’s only Simon.” It did not work, but it was hilarious. 2. 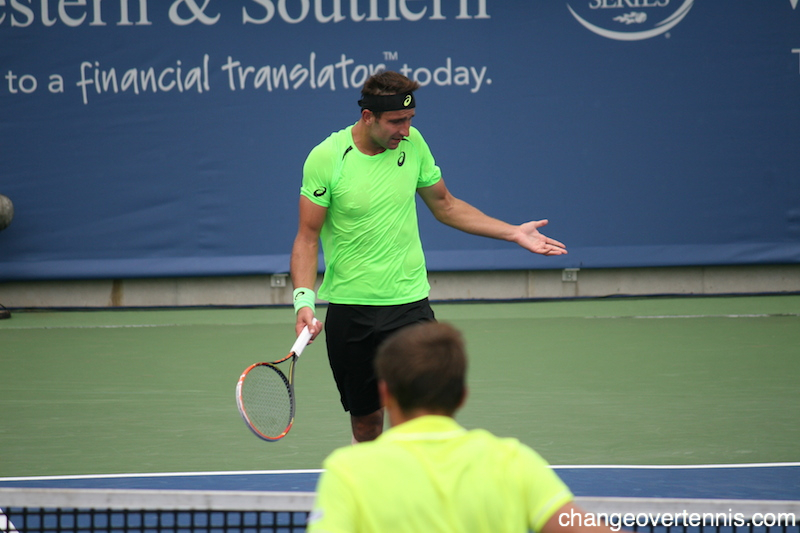 Mad Dog Matosevic lived up to his name in his match today against Nicolas Mahut. On match point, he walked up to the net for a handshake, thinking he’d served an ace and won the match. However, the chair umpire called it out, forcing him to walk back to the baseline and hit a second serve. He converted the match point, screamed what sounded suspiciously like “f@#$ you,” to the chair umpire, kicked at the cameraman trying to film him, and refused to shake the umpire’s hand. Mad Dog indeed. TAYLOR TOWNSEND: It was awesome (smiling). I was like, I have to do this in honor of Liezel. No, but it was really awkward at first because I thought that I was going to be able to return on both sides and I couldn’t. I can only return on my side. So I was like, if I can return on both sides, this would be a lot different. So giving away a free point on every deuce, on the deuce side sucked, but at the same time, we had like rallies and stuff which was surprising, because no one poached. So that made it easier for me. But one time I forgot we were playing doubles, I swear, because we were just ‐‐ Martina and I were just rallying crosscourt. I was like okay, 2 on 1. 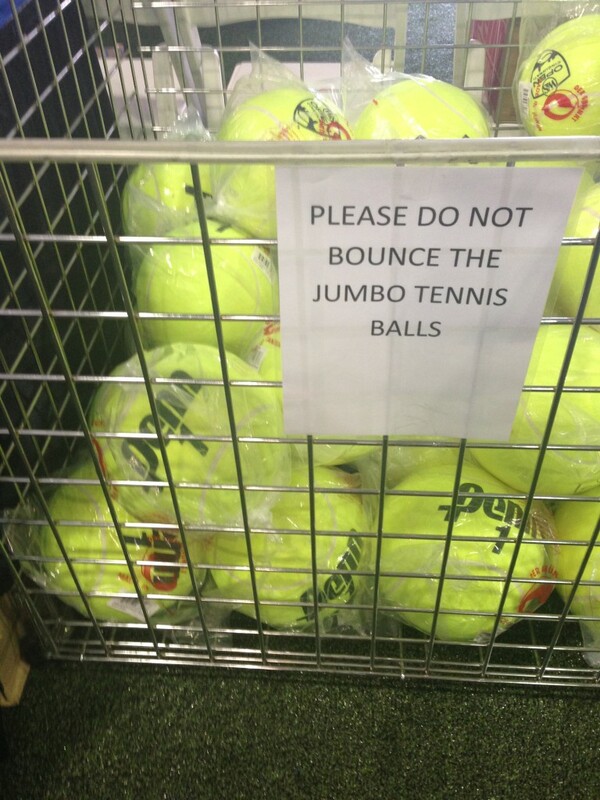 Okay, crosscourt. And the Rodionova hits in the alley. I’m like, Oh, right, doubles (laughter). So it was fun, though. It was something I have never done before. 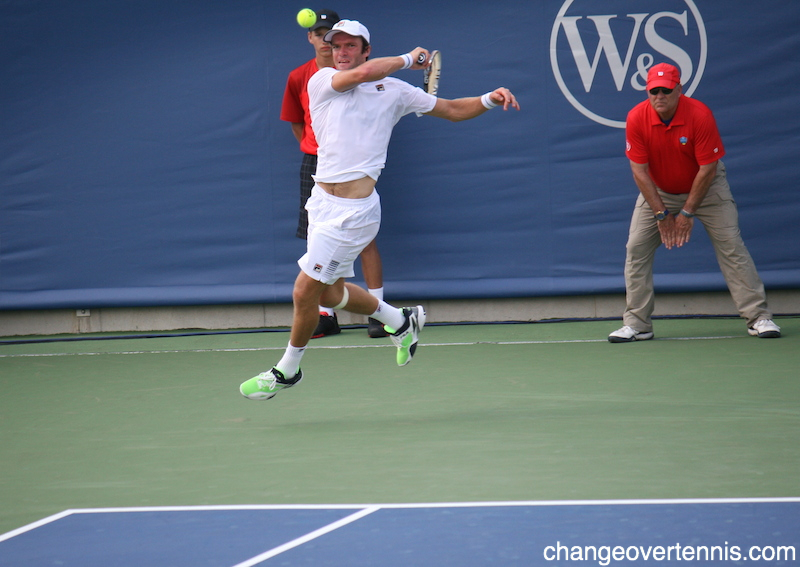 The fact I was able to do it and the Washington Kastles fans were cheering for me, I was like, Okay, it was worth it. I love her attitude and demeanor. She’s extremely professional and positive. Q. Your form since the French Open, we have seen the uptick and the quality improving. Was it hard work or a mental thing? CAROLINE WOZNIACKI: I’m in a great place right now, and I feel like I have been working really hard. You know, this is the part of the season I really like. I love playing on grass. I love the US Open Series. It’s definitely a part of the season I play well in. It’s definitely a confidence boost. I won Istanbul and kind of went from there. Q. Is there one particular tournament where you felt your level go up? CAROLINE WOZNIACKI: I think it was Eastbourne I felt already good. From there I feel like I have been playing really well. 6. We had a media all-access hour with the top eight seeds of the tournament, excluding Agnieszka Radwanska. Petra Kvitova is gorgeous in person. She was very personable and full of smiles, talking about her second Wimbledon title. She said she’s been working on focusing on every point, and that it was a strategy that paid off at Wimbledon, especially in her tough match against Venus Williams. She was proud of the way she played in the final, saying that it was probably the best match she’s ever played, and that she felt sorry for Genie Bouchard with the way things went. It’s the kind of comment that can come off wrong coming from the wrong person, but Kvitova seemed to genuinely empathize with Bouchard. 7. Simona Halep was quite charming in all-access hour. She talked about how great it was to win the title in Bucharest after Wimbledon, even though she was tired and carrying some injuries. I loved her confidence when she was asked if she could beat the other top players. Without hesitation, she said she knows she can beat anyone. She also talked about wanting to play beautiful, creative tennis, which is something we’ve all noticed from her as she’s risen to World No. 2. 9. Serena Williams was subdued in press, saying that she’s feeling relaxed going into the US Open, but that she feels she needs to work on her return game. Amy, thanks for keeping “Mad Dog” alive even though Matosevic hates the nickname. As soon as I read his comments about Mauresmo at Wimbleon, I immediately decided that to me he was going to be “Mad Dog” forever. Justice.